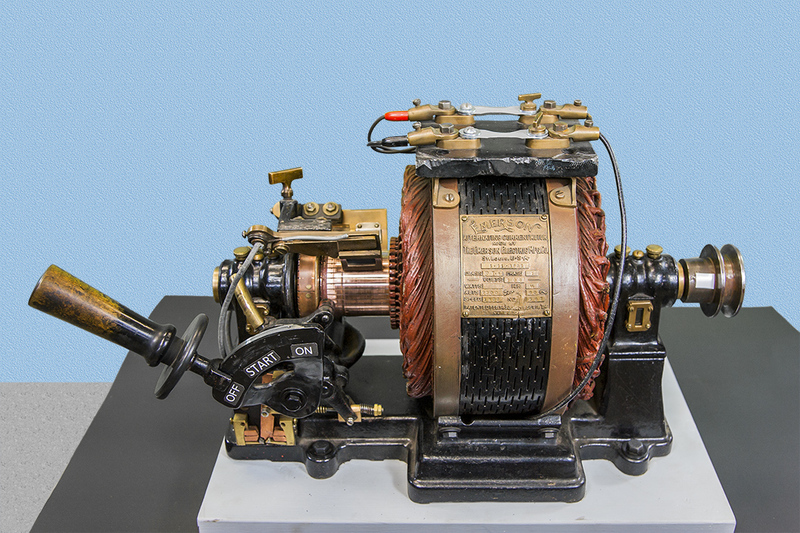 The Emerson 1901 ½ HP Single Phase AC motor. The repulsion-start induction-run motor, starts as a repulsion motor and runs as an Induction motor. The advantage of this starting scheme provided greater starting torque than a split phase motor could provide. The repulsion start motor rotor is wound similar to a direct current armature. The stator is energized creating an alternating magnetic field that runs through the rotor and induces a current in the rotor windings. The commutator brushes are short-circuited, and the currents induced in the armature coils set up poles on the armature surface. The brushes are set so that the poles are slightly out of line with the stator poles, and the mutual repulsion between like poles on the stator and armature produces the torque. For more views of the motor and and a description of the starting sequence please watch our video on our video page or on you tube. View our video on you tube.